Advent often centers around the events of the annunciation and the visit of Mary to her cousin Elizabeth, one young woman and one old, both pregnant in what would be considered either miraculous or scandalous circumstances. Elizabeth would have been a miracle, given her age and given the number of years that she and Zachariah had been married but without conceiving or bearing a child. Mary, on the other hand, was engaged to a man named Joseph, a simple man, a carpenter, but they had not yet consummated the marriage, possibly due to Mary’s young age, although we have no real idea what that age was. Joseph was an important figure. His story and Mary’s parallel to some extent and yet are somewhat different. Both received visitations from angels, both were told incredible things, and both were given the name of an impending child who would be Mary’s conception but not by Joseph, her husband-to-be. Joseph also received a visitation where he was told to complete the marriage to Mary even though Mary was pregnant, because this was to be a very special child whose name was going to be Jesus. Mary was wide awake when her angel came; Joseph was sound asleep when his visitation came in a dream. Mary followed the annunciation with a visit to a cousin, while Joseph stayed at home. Mary gave forth a beautiful acknowledgment and praise to God for the message that the angel had brought her. Joseph simply went and did as he was told. It seems Joseph was a quiet man, a silent man, one who plays an integral part but who yet says not a single word in the Gospels. I’ve been thinking about Joseph lately. He accepted a wife who was pregnant but not with his child. That is hard enough for a lot of men to accept, but when told, even by an angel, that the father of this child was God, I do not see how Joseph could be anything but incredulous and probably thunderstruck. I wonder, does he think about who could have been the baby’s father? Oh sure, he took the word of the angel, but it probably took a very big suspension of suspicion for him to accept it. Joseph and Mary had to go to Bethlehem to answer a census. We know there was no census in any of the years that Jesus could conceivably have been born (ca. 4BCE – 4CE), but it served as a way for the gospel to get Joseph and Mary to Bethlehem where the house of David had been established centuries before and where prophecy had said the Messiah would come. Even while looking for a place to stay in a very full town, Joseph never said a word that was recorded. The child came and, yet, Joseph said nothing. Of course, at that point in time, Mary did not say anything either, so evidently it was not very important to the story of the miraculous birth. There is the story of the wise men who arrive at Epiphany with gifts, but still the parents are silent. An angel comes to them and tells them that they need to leave because there was a warrant out to kill babies of a certain age who were perceived to be threats. They went to Egypt and stayed for a while. Unquestioning, they did as they were told, seemingly without argument or even comment. Joseph seems like a background character, but he was the earthly father figure involved in Jesus’s upbringing and a role model, teacher, and mentor, to Mary’s son. I wonder, did Mary and Joseph ever speak to Jesus of his unusual birth? Did they ever tell Jesus that Joseph really was not his father, or did they just go along presenting Jesus as Joseph’s son like a regular family? Did Joseph officially adopt Jesus? How did Jesus find out that God was his father, and when did he discover this? To me, it seems rather unusual for a human child, which Jesus was at this time, to instinctively know the spark of divinity within him, although we can guess that it happened when he was a very young child. Perhaps it was closer to the time when he was lost at the temple for three days. We just don’t know. What we do know, though, was that Joseph was present through part of Jesus’s life, and represented a father figure, maybe even a model for some of the men in the parables. 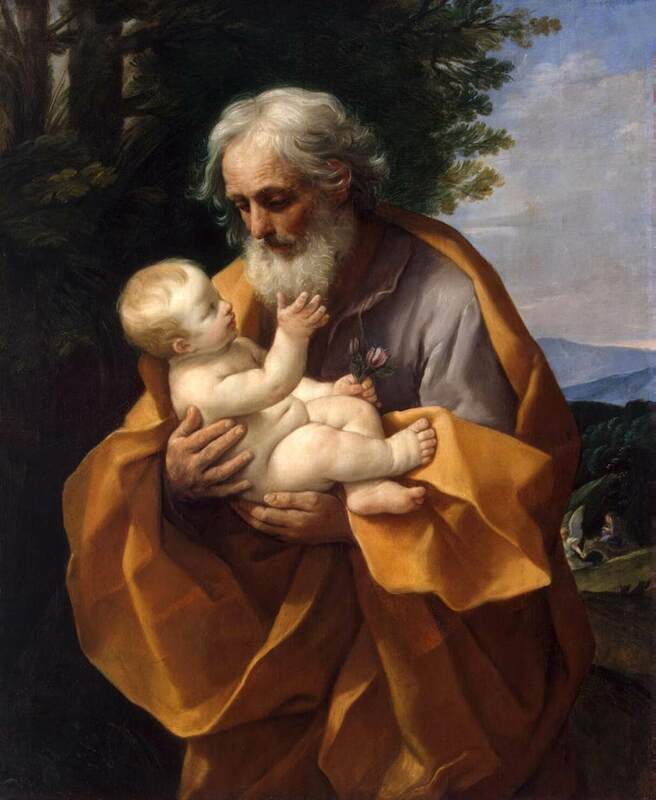 It’s impossible to know, but Joseph must have been a very good and strong man to accede to the request given by the angel and to continue throughout his lifetime to love, teach, and support a son who was not his and yet was as close as his own child would have been. Maybe what I learned from Joseph was that sometimes words are necessary. Acceptance? Of course. Faithfulness? Definitely. Strength? Yes. Joseph had to be a strong man, a good man, and one who put the well-being of others before himself. I am sure Jesus did not learn everything he had to learn from some supernatural force like angels or visions or whatever. I am sure a lot of what he had to learn especially in his very young life came from his parents, both Mary and Joseph. Joseph could teach carpentry, and could also serve as a religious model of a of a pious Jewish man who knew the rites and traditions that had to be done, knew the Scriptures, and followed them to the letter. Joseph was perhaps a quiet man, yet without him and his example, perhaps Jesus would have been just a little bit different as a human being. Pure speculation, but it is something to consider. So, this week I think I will concentrate on Joseph. Maybe if I listen hard enough I can hear him speak. What I do know, though, is that he is a role model, who seemed to use actions rather than words to live his part in the nativity story. I think I am learning to see Joseph in a whole new light. Note: Joseph is the patron of the church, carpenters, fathers, and social justice. He is also the patron of the dying. Linda Ryan is a co-mentor for two Education for Ministry groups, an avid reader, lover of Baroque and Renaissance music, and a homebody. She keeps the blog Jericho’s Daughter. She is also owned by three cats. She has been Episcopalian for over 50 years, and is grateful God led her to the Episcopal Church in various places.